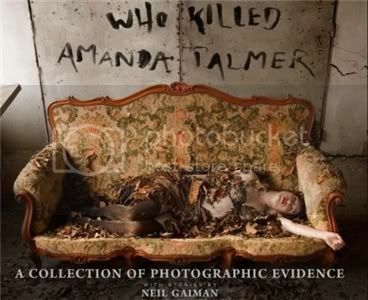 Who Killed Amanda Palmer: A Collection of Photographic Evidence is a big and beautiful book filled with photography, song lyrics by musician Amanda Palmer, and short stories by Neil Gaiman. 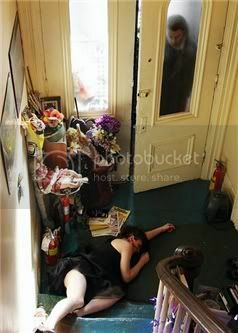 The pictures, by Kyle Cassidy, Beth Hommel, and many others, are of Amanda Palmer dead in difference places and from different causes. The lyrics are to Amanda Palmer's album of the same name, to which this book is a companion. And Neil Gaiman's short stories, which accompany some of the pictures, imagine scenarios that might have lead to Amanda Palmer's death. Sometimes they pose more questions than they give answers, but that only makes them more fun. One of my favourite stories was the one accompanying the picture below, in which three young girls find the body of their governess, Miss Palmer, floating in a lake. The good news is that you can read it online. Other highlights were the gritty, urban retelling of the fairy tale "Diamonds and Toads", the creepy love letter "Modern Love", and "The Sword", in which a time-travelling Amanda kills her younger self. Which brings me to another thing I wanted to mention: Who Killed Amanda Palmer is actually very funny. Really, it is. It's dark humour of a kind that perhaps not everyone will like, but it's most definitely my kind of humour. I think the book wouldn't work nearly as well as it does without the humour: the whole thing seems to have been done with the awareness that good art doesn't need to take itself too seriously to be serious, or evoke emotional responses. The laughter is there, but so are the horror and the occasional sadness. The overall tone is far from melancholy, though. This isn't so much a book about death as it is a book that celebrates life. Very young children made up songs about the different ways Amanda died, killing her happily at the end of every verse, too young to understand the horror. Maybe it really was how she would have wanted to go. If you see Amanda Palmer on the street, kill her, said the graffiti under the bridge in Boston. And beneath that somebody else wrote, That way she'll live forever. Visit the album's official site to find out more, stream songs, and watch awesome videos. I am envious! I love the album, I love Amanda, I love Neil, I love them together, I love the concept for the book, I love the review. I think you should tweet a link to AFP of your review; it's the first I've seen in the blogosphere. Claire, Chris at Stuff as Dreams Are Made On actually reviewed it a few weeks ago, AND she tweeted about his review :o Maybe I'll do that later if I manage to gather the courage :P Which I probably will, as she doesn't intimidate me as much as other people I look up to do. I met her once, and she was SO nice and approachable! Amanda: To each their own, of course! Apolgies for not being aware of Chris's review; I must check it out. She comes across as really down-to-earth from what I've read and Twitter but great to hear she is really like that in person! I admire her work ethic and respect for fans, which is so similar to Neil Gaiman's. I am desperate to buy this for a friend because it really is her cup of tea too (an artist friend of hers painted her in a dead pose). So glad that you finally received your copy of this! I've never listened to her before but the book does look pretty cool!! This looks so bizarre and macabre. I don't quite know what to think about it. And I generally like bizarre, macabre things. How are the stories? Do they work as standalones? The shorts Gaiman wrote for Tori Amos' Strange Little Girls made no sense to me because I hadn't heard the album. Lu: Infinite hearts for Regina! Loren Eaton: It's bizarre, I guess, but not as macabre as it sounds :P I really understand that it's not for everyone, though. I think the stories work as standalones in the sense that you can understand them without the music, but they probably couldn't be separated from the pictures. You can always give the one I linked to a try. It's a really quick read. Oh this is right up my alley! I was reading it and looking at the pictures, and was (I hesitate to say) laughing! I don't know anything about Amanda, but love Ms. Spektor. This is the kind of creativity that makes my head buzz! I remember seeing this on Chris's blog and wanting to read it. I'm glad to see you had the same opinion of it! Yikes! I'm not sure I'm ready for all those pictures. What a neat concept for a book! I really like that the album and the book tie into each other. I will have to try and give this a look. You are also the first person who I have ever heard mention Regina Spektor! I love her, and have a lot of her music. Awesome, you've made my day! What an interesting-sounding book! I love projects that put together a diversity of elements. Music, photography and short stories. Sounds lovely! This book sounds absolutely wonderful and I'm heading right now to buy it. I love the combination of photography and storytelling, and of course with Neil Gaiman, how can you go wrong? What interesting pictures! They look posed, so they don't look gruesome. It looks like a fun book! I don't think I've read anything like this! That's such an interesting concept!! I first learned of this book on Chris's blog and immediately headed to itunes to hear her music since I was unfamiliar. I decided I didn't really like her music BUT I *really* like the song you've posted here. Of course, anything with piano sweeps me off my feet (Hello Tori!). This looks SO COOL, holy cannoli! Wow, this looks super-interesting. I'm ashamed to say I don't know Amanda Palmer!! What kind of former college radio DJ am I?? LOL...I think we're freaking people in the blog world out :p I'm so glad that you got this wonderful book!! Wasn't it awesome? I've read it probably 20 times now. It's so good! I'm with you on the humor. I just totally lost it when I got to the picture towards the end with the hand flying across the walkway, lol. That one cracked me up. Great review Ana! Tweet it! I read Chris's review and am now desperate to have this book. Even though I had NO IDEA who Amanda Palmer is, aside from Neil Gaiman mentions her on his blog occasionally. Must get on that. Oh…how did you get your hands on this book? I have been hearing about this book on Gaiman's site for a long tiem. Good to hear it's as good as he says it is. Some very creative concept though. I want this! I am very, very fond of the Dresden Dolls, so I was pleased as punch when I discovered Amanda Palmer and Neil Gaiman were collaborating on this. And I think it's perfect that they're dating now - they are two people about whom I have often thought it must be weird to live inside their heads, and for more or less the same reasons. So, perfect. That first picture freaks me out! I think it's the font of the writing on the wall. I haven't heard of a book like this before, it sounds cool. gaiman has been going on and on about amanda palmer on twitter for ages now and i was wondering what it was all about! JoAnn: lol, I guess it is :P But good bizarre! Sandy: yay, someone shares my sense of humour :D If you like Regina Spektor's music I think you might like Amanda's too. I hope you do! Lena: Hmm, the solo album (also called Who Killed Amanda Palmer) is a good place to start. The Dresden Dolls' albums are good too, though! They only have two, and I like the first one (self-titled) a bit more than the second, but both are good, so there's really no going wrong. Zibilee: Regina has quite a cult following I think! I hope you do give this (and Amanda's music) a look! rhapsodyinbooks: I didn't think they were gruesome too. There are a few in the book with blood, but they were actually less violent than I expected. Melody: Yeah, it's very much its own thing! Michelle: I hope you give her music a try! She's seriously awesome. Violet: I ordered it online! Pre-ordered it, actually, as I was paranoid about it selling out :P Chris laughed at my fears and he turned out to be right. Jenny: I know what you mean, and I think it's perfect too! Kim: You know, I hadn't paid attention to the font, but I can see your point. It's such a good photo, though. JP: There's the collaboration, and there's them being a couple too :P Also, I didn't know you were on twitter - may I stalk you, kind sir? I remember seeing this the other week on Chris's site. I thought it was interesting then. I didn't realise this was Neil Gaiman's girlfriend, what a fabulous working relationship they must have. The book looks amazing,but I doubt I can afford it these days. Think I'll put it on my wishlist for my 30th bday! I need to get my review written! This was a great book. Any time you combine these three wonderful artists, you're going to get something magical. I love Regina Spektor, too! Do you have her new album? Valentina: She really is gorgeous, and yes, you should listen to her! If you and Chris hadn't already sold me with your reviews, you may have done it when you mentioned Regina Spektor! Thanks! wow this sounds interesting! very different! All the pictures inspire me to do something interesting for this year's Something Sinister photo contest! This sounds really interesting! I like Who Killed Amanda Palmer but have never heard of this! Thanks!